American DJ FREQ Matrix DJParts - All Variety of Parts that DJ Needs. Add more creativity to your lightshow with ADJ’s FREQ MATRIX revolutionary 16-Zone LED Strobe matrix. This 2-FX-IN-1fixture features a traditional LED strobe + 16-Zone matrix chase effect. The matrix zone chase effect gives lighting designers the ability to create exciting and dynamic energy-driven lighting shows. The FREQ MATRIX offers full DMX control with 4 DMX channel modes, dimming, strobe speed and chase speed. Users can also run the FREQ MATRIX in sound active mode, or manually control strobe speed and dimming on the back of the unit from it’s potentiometer knobs. The FREQ MATRIX uses sixteen 5-Watt bright white LEDs and consumes a maximum of 107-watts of power. 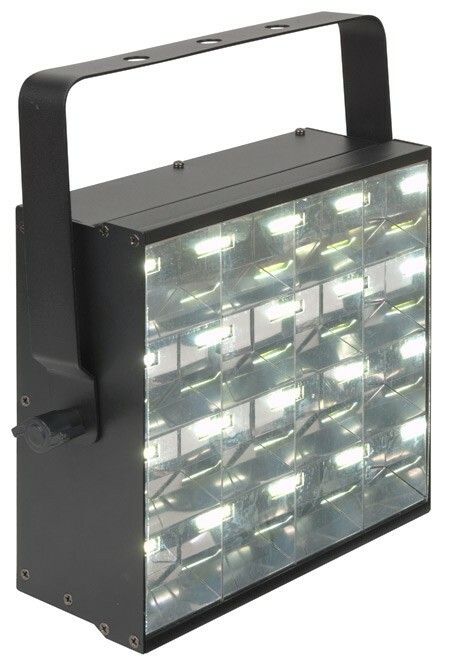 Specifications: • 2-FX-IN-1: Traditional LED Strobe/Blinder + 16-Zone chase effect • 16x 5-Watt White bright LEDs (30,000 hr. rated) • 4-Button DMX LED Display • 3 Operational modes: DMX controller, Master/Slave & Sound Active • 4 DMX Channel modes (1, 2, 16 or 18 Ch.) • Strobe speed: control via DMX or potentiometer knob on rear of unit • 0-100% dimming: control via DMX or potentiometer knob on rear of unit • Includes exciting sound activate built-in matrix programs • LED pulse & strobe effect • Strobe up to1200 times per minute • Fan Cooled • Extremely Long Life (30,000 hr. rated) • Runs extremely cool! - NO Duty Cycles! – Run all night! • Includes hanging bracket • Safety hook on rear panel • Very low power consumption - connect more units in a single circuit • IEC AC IN/OUT on rear to daisy chain power (up to 3 Freq Matrix’s @ 120V and 6 Freq Matrix’s @ 230V ) • Compatible with American DJ UC3 Series easy-to-use controllers (sold Separately) • Power Consumption: 107W maximum • Multi-voltage Operation: AC 100 - 240V, 50/60Hz • Dimensions (LxWxH): 11.75” x 11.5” x 4.75”/ 295 x 291 x 115mm • Weight: 8 lbs. / 3.6 kg.